(For Unreserved-03 and for ST-01 post. 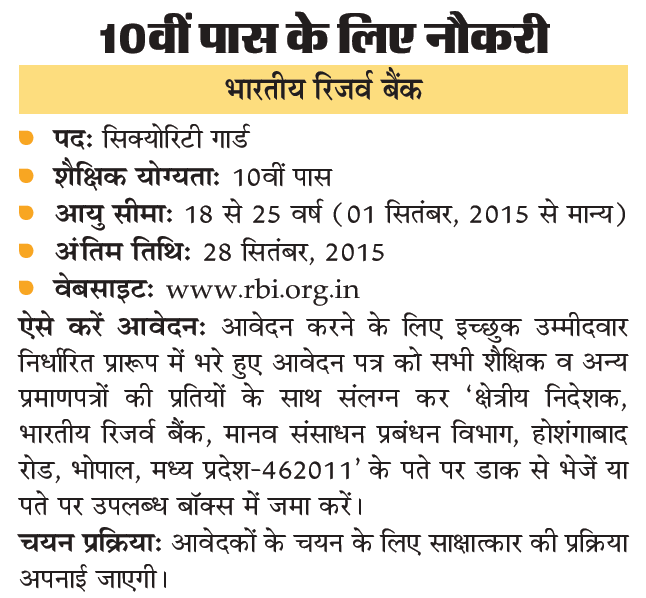 Last date for application-28.09.2015.Age as on 01.01.2015-18 to 25 years.Relaxation as per govt.rules. (For Unreserved-01,for ST-01 post and for SC-05 Posts.Age as on 01.08.2015-Not more than 25 years.Relaxation as per govt.rules.Last date for application-18.09.2015. How to apply-Apply on prescribed format of application.No other mode for submission of application is available. 220(4)-7230 - 260(3)-8010-300(3)-8910-400(2)-9710-500(4)-1171o-680(3)-13750 (20 years). Qualification-Minimum 10th pass and maximum Undergraduate.Graduate Degree holders are not eligible and need not apply. The selected Security Guards will have to work in shifts, including night shifts. How to apply-Apply on prescribed format of application with latest passport size signed photograph (3 cm x 2.5cm) should be affixed with application form.One envelope should contain application of one candidate only. No correspondence will be entered.Latest passport size signed photograph (3 cm x 2.5cm) should be affixed on application form.